The co-pilot of the James Brodie crew was Lloyd Vevle. 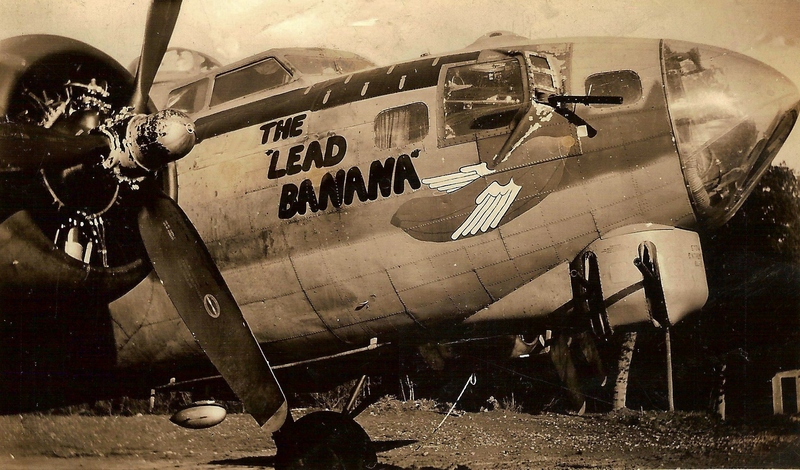 He lost his life in the September 28, 1944 mid-air collision between his B-17, Lazy Daisy, and the Buslee crew’s B-17, Lead Banana. I have written about Lloyd previously here. Lloyd had a twin brother named Floyd in the 390th Bomb Group. Floyd lost his life early the next year on January 14, 1945. I have also previously written about Floyd here. 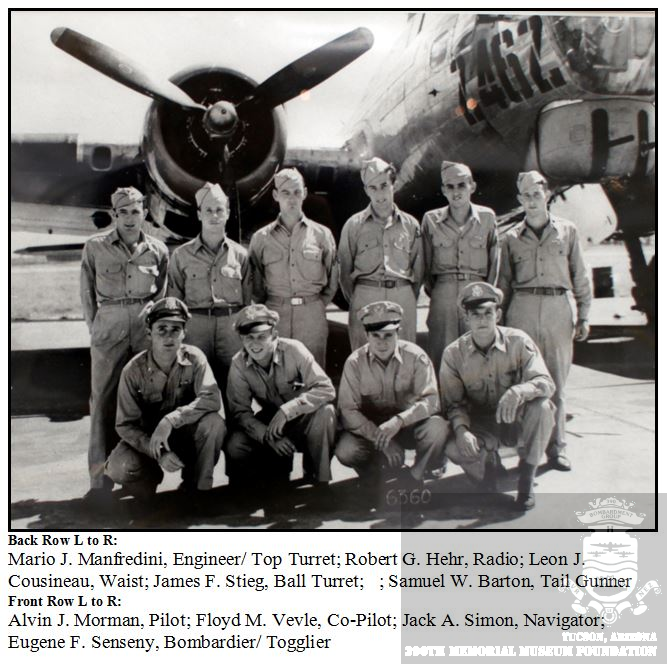 The reason I am returning to the story of the Vevle twins at this time is that 384th Bomb Group Combat Data Specialist Keith Ellefson has informed me that the American Air Museum in Britain website has found and added photos of the Vevle boys. Since the AAM so kindly shares their photos, I am pleased to have the opportunity to share them here. As I’m digging into research again on the Buslee and Brodie crews, I need to revisit sources like the American Air Museum in Britain for updated information on all of the boys of both crews. I also will be digging into the research records that I obtained from the National Personnel Research Center during my visit last October. The picture of these two crews and their families becomes clearer to me with every bit of information I find. Thank you to all of them for the sacrifices they made in WWII. 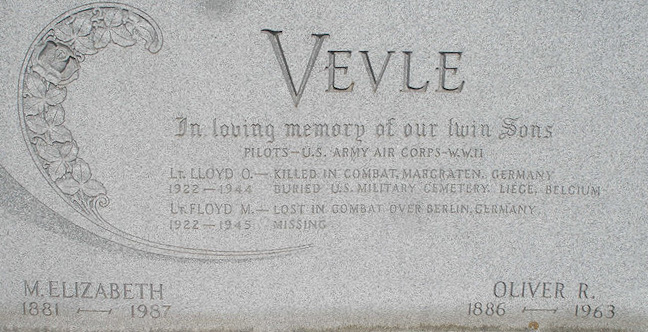 To recap, Lloyd Vevle was a co-pilot in the 384th Bomb Group based in Grafton Underwood, England. 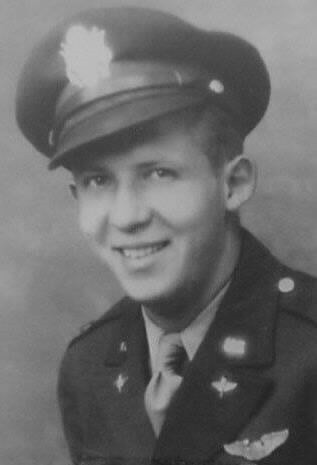 Lloyd lost his life on the 384th’s September 28, 1944 mission to Magdeburg, Germany. Involved in a mid-air collision, Lloyd could not bail out of his B-17G and his body was recovered near Ostingersleben, Germany. His parents were likely notified of his death on January 28, 1945. Less than 100 miles from Grafton Underwood, Lloyd’s twin brother, Floyd Vevle was part of the 390th Bomb Group of the 8th Air Force based in Framlingham, England. Floyd was co-pilot of the Alvin J. Morman crew. Nearing the I.P. (Initial Point of the bomb run) at about 1240 hours, their squadron was attacked by approximately one hundred German FW 190’s and ME 109’s in the area between 5300N-1200E and 5220N-1250E at about 1240 hours. With information from the Missing Air Crew Report, MACR11719, I will try to piece together the series of events that took place aboard 44-8426. As a result of the enemy aircraft attack, the interphone system of communication was disabled and a wing was on fire. The crew resorted to the use of signals to convey to each other that the ship was going down. Radio Operator, T/Sgt. Robert G. Hehr and Waist Gunner, S/Sgt. Leon J. Cousineau were either killed instantly or mortally wounded in the initial attack, or succumbed to anoxia (oxygen deprivation). Tail Gunner S/Sgt. Samuel W. Barton bailed out first, likely from the tail gunner’s emergency exit. Reported by an unknown crewmember, Barton observed Cousineau before he left the ship and said Cousineau was in a daze. Top Turret Gunner/Engineer T/Sgt. Mario J. Manfredini made his way to the front escape hatch where he met Co-pilot 1st Lt. Floyd M. Vevle. Vevle motioned Manfredini to bail out before him. Vevle, standing behind Manfredini, was wearing his parachute and was himself prepared to bail out. Manfredini noted that Pilot 1st Lt. Alvin J. Morman was “still at the controls trying to keep plane level when I jumped.” Morman was also observed wearing his chute. Manfredini does not know if Vevle followed him out, but reported that Navigator, 1st Lt. Jack A. Simon did follow him out and that Togglier/Nose Gunner, 1st Lt. Robert Springborn followed Simon. Surviving crew members believed that Vevle and Morman may have engaged the autopilot and gone to the rear of the ship to help other crewmen still on board. Simon continued, “Because of the erratic flight of the aircraft, he [Stieg] assumes that the ship was flying out of control. Although he did not go forward of the radio room, he feels that there was no one in the pilot’s compartment.” Though he didn’t feel anyone was in the pilot’s compartment, Stieg did not report seeing either Morman or Vevle in the waist. By this time, Morman and Vevle, if they had remained in the pilot’s compartment, may have been killed in the continuing attack or may have succumbed to anoxia. Barton, Manfredini, Simon, Springborn, and Stieg all became prisoners of war. Stieg was hospitalized. All of them eventually returned home. Cousineau, Hehr, Vevle, and Morman were assumed to be in the ship when it struck the ground or blown out when it exploded. Hehr and Cousineau were in the waist, Vevle and Morman may have still been in the cockpit. According to Stieg, Hehr and Cousineau were dead. The condition of Morman and Vevle was not known. Simon reported that “The only additional information was obtained from the German colonel who interrogated me, who for some unexplainable reason called me in just before my release from the interrogation center to inform me of the disposition of my crew. According to his statement, the bodies of Lt. Vevle, Lt. Morman, Sgt. Cousineau and Sgt. Hehr were found in the airplane. The others were accounted for as prisoners of war except for Sgt. Stieg, regarding who whereabouts he was uninformed. At that time, it was later learned from Stg. Stieg, he was in a hospital in Berlin. It is possible that a more exact position of where the aircraft crashed may be obtained from Sgt. Stieg.” German authorities at the Interrogation Center told other survivors that Lt. Vevle, Lt. Morman, Sgt. Cousineau, and Sgt. Hehr were found in or near the wreckage of the airplane. One source (http://www.fieldsofhonor-database.com/index.php/american-war-cemetery-henri-chapelle-v/50115-vevle-floyd-m) states that Floyd Vevle was initially buried at the Wachow Community Cemetery, but that after the war, his body could not be found. Even though the German Colonel at the Interrogation Center reported that four bodies were found in the crash, MACR (Missing Air Crew Report) 17119 which covers the loss of the crew, does not report that his body was found at the crash site. MACR11719 shows that Robert G. Hehr, Leon J. Cousineau, and Alvin J. Morman were found dead near the place of the crash, 3.5 km west of Wachow and 20 km northeast of Brandenburg. Interment was January 16, 1945 in the community of Wachow. Floyd Vevle’s name was not included among the dead. Within a 109-day period of WWII, Oliver Vevle lost both of his twin sons, Lloyd and Floyd. Both in the 8th Air Force. Both Co-pilots. Both killed in action over Germany. Floyd is still considered missing. Floyd Vevle is memorialized on the Tablet of the Missing at the Henri-Chapelle American Cemetery in Henri-Chapelle, Belgium. Floyd earned the Purple Heart and the Air Medal with 3 Oak Leaf Clusters. Floyd’s twin brother, Lloyd Vevle of the 384th Bomb Group, is buried in Plot C, Row 37, Grave 20 at the Ardennes American Cemetery in Neupre, Belgium. Like his twin brother, Lloyd earned the Purple Heart and the Air Medal with 3 Oak Leaf Clusters. Thank you to Keith Ellefson, combat data specialist for the 384th Bomb Group research group for providing me with a copy of MACR11719. Oliver R. Vevle was born in Illinois in 1886. Both of Oliver’s parents were from Norway. Louise Cleveland was born in Illinois in 1884. Both of her parents were also from Norway. Oliver and Louise married on May 6, 1911 in Fort Dodge, Webster County, Iowa. Their first-born son, Rudolph (Rudy) Bernhardt Vevle, came along on October 22, 1912. In 1920 (according to the federal census), Oliver and Louise Vevle lived at 334 7th Avenue North in Fort Dodge. Martha Cleveland, Louise’s mother, lived with Oliver and Louise. Oddly, Rudolph was not listed in the census record, possibly simply an oversight in recording the census. Oliver worked as a bank teller. On December 9, 1922, twin sons Lloyd Oliver and Floyd Martin were born. On October 19, 1925, Louise Vevle died at the age of 41, leaving her husband, Oliver, to raise their three sons. She was buried three days later, on October 22, Rudy’s thirteenth birthday. The twins, Lloyd and Floyd, had not yet reached their third birthday. Almost four years later, on August 15, 1929, Oliver remarried. His new bride was Martha Elizabeth Richardson Vevle, born in Illinois in 1882. Like Oliver, her parents were born in Norway. In 1930 (according to the federal census), Oliver and Martha and the rest of the Vevle family lived at 6th Avenue North in Fort Dodge. Oliver was a teller at a savings bank. At 17 years old, Rudolph worked as a grocery store clerk. The twins were 7. Martha was listed as Elizabeth M., so possibly she preferred to go by her middle name. A 1940 census record for the family eludes my searches, but a 1940 city directory lists Lloyd as a student and Floyd as a salesman at L&L Department store. Their father, Oliver, was listed as a teller at the Fort Dodge National Bank. By the printing of the 1941 Fort Dodge city directory, Lloyd and Floyd were both listed as students. 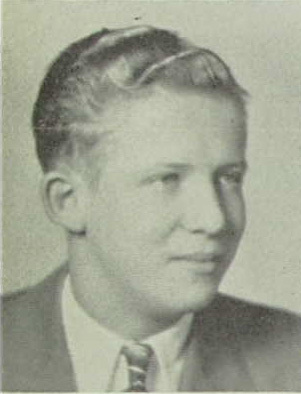 Both boys graduated from Port Washington High School in 1940. Thank you to Sarah Little, who found that a 1940 census record does exist for the Vevle family. Sarah gave me the enumeration district number, page number, and location for the record. After more research I discovered that Ancestry.com had transcribed their last name as Viole and the record was therefore not coming up in searches. In 1940, the Vevle family still lived on 6th Avenue North in Fort Dodge, Iowa. Oliver held the same job as in 1930 as a teller in a bank. Son Rudolph no longer lived at home, but Lloyd and Floyd, at 17 years old, did. On April 7, 1942, oldest brother, Rudy, enlisted in WWII. His residence was noted as Cook County, Illinois, and his place of enlistment as Chicago. His enlistment record states that he was single and had two years of college. He served as a technical sergeant in the US Army. On November 4, 1942, Floyd enlisted in the US Army Air Corps. His residence was noted as Webster County, Iowa, and his place of enlistment as Minneapolis, Minnesota. His enlistment record states that he was single and had two years of college. January 31, 1943? Lloyd also enlisted in the US Army Air Corps, but his enlistment record raises some questions. His record states that he was born in 1908, not 1922. It does note his residence as Webster County, Iowa, but incorrectly shows his highest level of education was grammar school. His place of enlistment was noted as Jefferson Barracks, Missouri. His enlistment date was noted as January 31, 1943. Lloyd’s record also noted that he was a widower without dependents, although I have not found a marriage record for him. Both boys, Lloyd and Floyd, became co-pilots in the 8th Air Force in WWII. Lloyd was assigned to the 545th Bomb Squadron of the 384th Bomb Group (Heavy) on AAF Station 106 Special Orders #148 dated 26 July 1944, James Joseph Brodie Crew. The 384th was based in Grafton Underwood, England. Lloyd’s first mission was as Brodie’s co-pilot on the 384th’s Mission #174 to Dugny (Paris), France. The target was a German Air Force (Luftwaffe) fuel depot. Lloyd earned the title of First Lieutenant by his nineteenth mission on September 28, 1944, the 384th’s Mission #201 to the Krupps Steel Manufacturing Plant in Magdeburg, Germany. It was on this mission that the Brodie crew’s aircraft, Lazy Daisy, collided with the John Oliver Buslee crew’s aircraft, Lead Banana, coming off the target at Magdeburg. 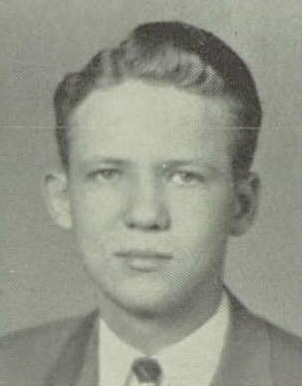 Lloyd Oliver Vevle was one of the eighteen crew from both flying fortresses listed as missing in action. Floyd was assigned to the 568th Bomb Squadron of the 390th Bomb Group. The 390th was based in Framlingham, England. (Framlingham is just shy of 100 miles from Grafton Underwood.) Ten days after Lloyd was declared missing, Floyd flew his first mission. Would Floyd have gotten word by then that his twin brother was missing in action? It was the 390th’s October 7, 1944 Mission #202 to Bohlen-Biefeld, Germany. Note that each bomb group had their own unique numbering system for missions. Also note that Lloyd’s last mission was #201 and Floyd’s first mission was #202. On January 14, 1945, Floyd flew his twenty-seventh mission with the 390th Bomb Group, Mission # 243 to Derben, Germany. He was aboard aircraft 42-8426. Floyd was killed on that mission and he still considered missing. I estimate that the Oliver and Martha Elizabeth Vevle received word of Lloyd’s death in the September 28, 1944 mid-air collison around January 28, 1945, two weeks after his twin brother, Floyd, died. I base this date on the fact that the Buslee family learned of their son Jay’s death that date and because the identification of both Buslee and Vevle were reported on the same telegram form. Rudy returned to the states on June 20, 1945, arriving in New York on the Queen Mary. He was released from the service on January 18, 1946. 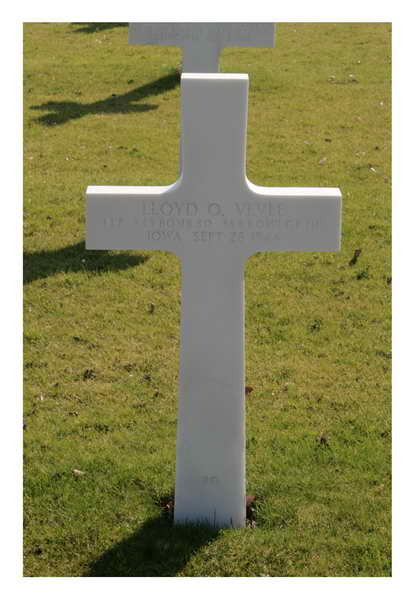 Lloyd Vevle is buried in Plot C, Row 37, Grave 20 at the Ardennes American Cemetery in Neupre, Belgium. 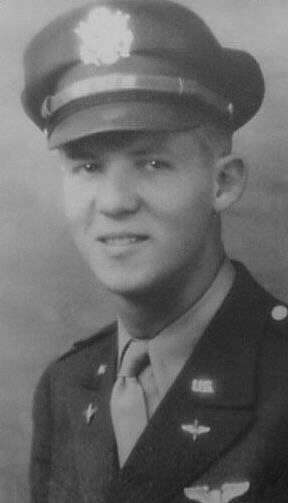 Lloyd earned the Purple Heart and the Air Medal with 3 Oak Leaf Clusters. Floyd Vevle is memorialized on the Tablet of the Missing at the Henri-Chapelle American Cemetery in Henri-Chapelle, Belgium. Like his twin brother, Floyd earned the Purple Heart and the Air Medal with 3 Oak Leaf Clusters. In 1950, Oliver and Martha Elizabeth Vevle traveled abroad, possibly to visit Lloyd’s grave and find Floyd’s name on the Tablet of the Missing. A passenger list shows them returning on the Queen Elizabeth, leaving Southampton on September 29 and arriving New York October 4. Lt. Lloyd O. (1922-1944) — Killed in combat, Mahgraten, Germany. Buried U.S. Military Cemetery Liege, Belgium. Lt. Floyd M. (1922-1945) — Lost in combat over Berlin, Germany. Missing. Lloyd and Floyd’s older brother, Rudy, died on June 13, 2000 at the age of eighty-seven. The 390th Memorial Museum is located on the grounds of the Pima Air & Space Museum in Tucson, AZ. The 390th’s reunion will be held October 16-17, 2015 in Tucson. The 384th’s reunion will be held later that same month, also in Tucson. On Friday, Oct 30, 2015, the 384th reunion attendees will tour the Pima Air and Space Museum in Tucson. I am looking forward to visiting the 390th Memorial Museum during the reunion. My next post will continue with more information on Floyd Vevle gleaned from MACR11719, the missing air crew report regarding his last mission with the 390th Bomb Group. I had hoped to include the information in this post, but due to a power outage from a large thunder storm sitting over central Florida, I could not finish the job Tuesday evening. Thank you to Keith Ellefson, combat data specialist for the 384th Bomb Group research group for providing me with a copy of MACR11719. I know Floyd Vevle did not serve with the 384th and is therefore outside of the scope of my usual posts, but being he was Lloyd Vevle’s twin brother, I determined that the information about him was pertinent to the Vevle’s and the 384th’s story. 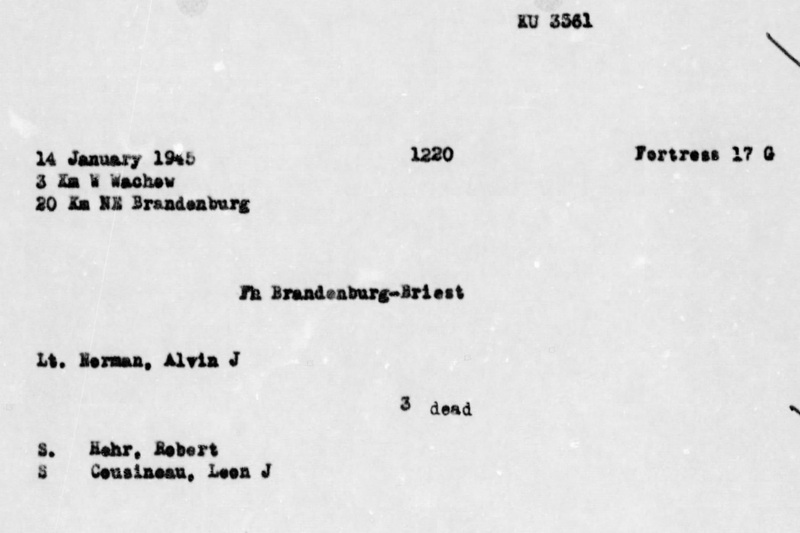 The day after Christmas 1944, at ninety days missing in action, the US Army Air Forces wrote to the Buslee crew’s next of kin and enclosed a list of the names of the crew members on the Lead Banana on September 28 and also included the names and addresses of next of kin in case the families wanted to communicate with each other. For reasons of military security it has been necessary to withhold the names of the air crew members who were serving with your son at the time he was reported missing. Since it is now permissible to release this information, we are inclosing a complete list of names of the crew members. The names and addresses of the next of kin of the men are also given in the belief that you may desire to correspond with them. 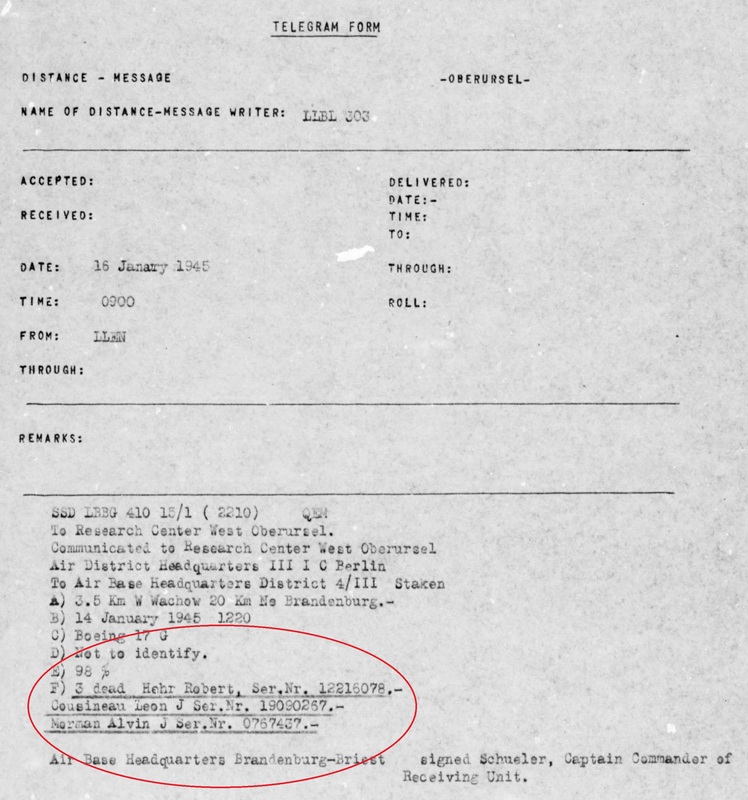 The above list is also a part of MACR (Missing Air Crew Report) 9753. For a diagram and list of each man’s position on the Lead Banana on September 28, 1944, click here. The Brodie crew’s next of kin must have gotten the same letter and a list of those on the Lazy Daisy. The following list is attached to MACR9366. For a diagram and list of each man’s position on the Lazy Daisy on September 28, 1944, click here. 2nd Lt. George M. Hawkins, Jr. If the US Army Air Forces had told the families of the two crews what actually happened to their sons’ aircraft and provided the lists of both crews to the families, the families of the two pilots, Buslee and Brodie, would have discovered that they lived only seven and a half miles apart in Chicago, Illinois. These families would most likely have been very interested in communicating if they had been made aware of each other. Atkins and Vevle were from the Brodie crew aboard Lazy Daisy. Buslee, Albrecht, and Bryant were from the Buslee crew aboard Lead Banana. Atkins was probably located away from both crash sites as he was carried away with the nose of the Lazy Daisy during the initial impact of the collision. In determination of the fate of the two crews, eighteen total men, this report updates the count to fourteen (14) recovered dead, with twelve (12) identified, and four (4) P.O.W.s. MACR9753 does not include any more Telegram Forms or Reports of Captured Aircraft and does not provide any information on the identifications of Sebastiano Joseph Peluso aboard Lead Banana or James Joseph Brodie aboard Lazy Daisy. This information can be found on pages 18 of MACR9753. MACR stands for Missing Air Crew Report. The diagram shows the combat position of each Brodie crewmember on Mission 201 on September 28, 1944. Only one crewmember manned both waist gunner positions on this mission. If they were all still in position after coming off the target at Magdeburg, the diagram shows where each man would have been at the time of the mid-air collision with the Lead Banana. The only survivors of the mid-air collision this day with the Lead Banana were the waist gunner, Harry Allen Liniger, the navigator, George Marshall Hawkins, Jr., and the tail gunner, Wilfred Frank Miller. Thank you to the 91st Bomb Group for granting me permission to use and modify their B-17 diagram for use on The Arrowhead Club site. Maps of the area show the location of the mid-air collision and subsequent crash sites of the Lead Banana and Lazy Daisy on September 28, 1944. Two maps are included below. The first map shows the collision site and crash sites of the Lazy Daisy and Lead Banana. The mid-air collision occurred after coming off the target at Magdeburg, at 12:11 pm on September 28, 1944 at 52°06’N 11°39’E (X on the first map, just past the second “g” in “Magdeburg”). Both planes crashed approximately 20 miles northwest of the mid-air collision. Lazy Daisy crashed near Erxleben (E on the first map) and Lead Banana crashed approximately one and one-quarter miles north of Ostingersleben (O on the first map). 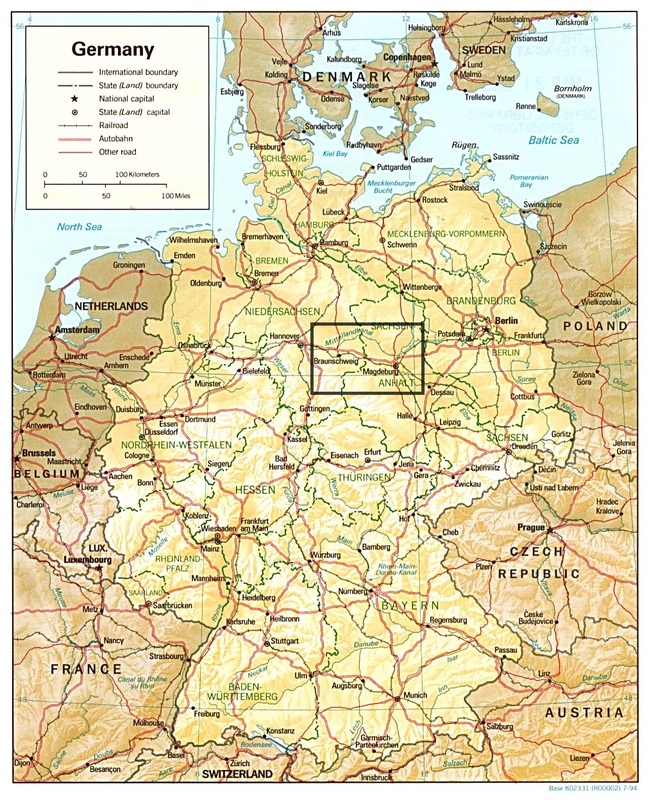 The second map is a map of Germany with the area of detail outlined. Royalty free map of Germany obtained from http://www.tourvideos.com/maps-Germany.html. The B17-G aircraft with serial number 42-31222 was assigned to the 384th Bomb Group, 546th Squadron. 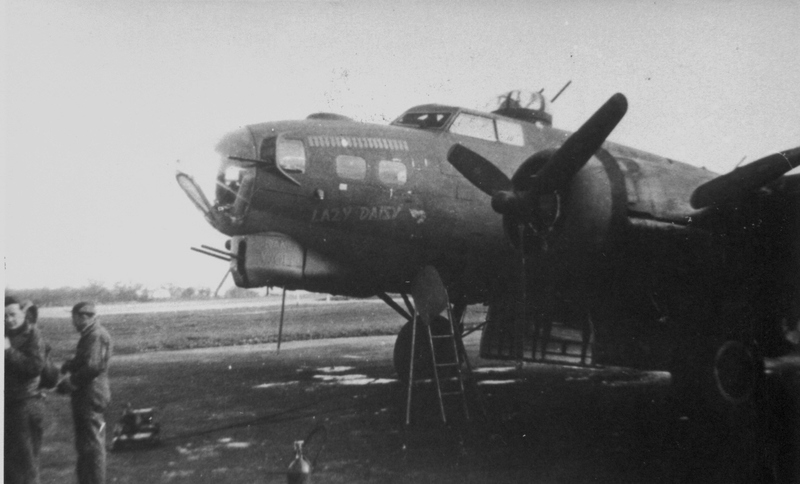 Known as Lazy Daisy, it completed 45 missions, returning safely to base on 44 of those missions. Its first mission, on December 5, 1943, was to a German Air Force (Luftwaffe) Fighter Airfield in St. Jean D’ Angely, France. Its last mission, on September 28, 1944, was to a steelworks plant in Magdeburg, Germany. The crew was able to complete its assignment and drop its bombs over Magdeburg, but was involved in a mid-air collision coming off the target. James Joseph Brodie, Lloyd Oliver Vevle, Byron Laverne Atkins, Donald William Dooley, Robert Doyle Crumpton, and Gordon Eugene Hetu, all aboard the Lazy Daisy, did not survive the crash. George Marshall Hawkins, Jr., Wilfred Frank Miller, and Harry Allen Liniger, became POWs. Wilfred Frank Miller and Harry Allen Liniger were confined at Stalag Luft IV. George Marshall Hawkins, Jr., was confined at Obermassfeld Hospital #1249 (Serves Stalag 9-C), Obermassfeld Thuringia, Germany 50-10. Donald William Dooley was not part of the 545th Bomb Squadron. He was assigned to the 384th Bombardment Group Headquarters Complement. September 28, 1944 was his only flight. The crew chief for Lazy Daisy was James F. Flynn. Brodie, Vevle, Hawkins, Crumpton, Hetu, Miller, and Liniger were all original Brodie crew members on the aircraft. William Edson Taylor, did not fly on the September 28 mission. On October 5, he flew as Radio Operator/Gunner with the Robert Bruce Birckhead crew. His aircraft was damaged by flak and crashed near Munchen-Gladbach, Germany (MACR 9754). Of the crew, four were killed, and five were taken prisoner of war, including Taylor. Donald William Dooley’s first mission would be his last. He flew as Radio Operator/Gunner for the Brodie crew. Source: Sortie Reports for Lazy Daisy.